So, with Dublin as his blank canvas, Oliver set out to exhibit, promote and sell quality Irish paintings. He acquired premises at 17 Clare Street in the form of a large Georgian house which happily sits cheek-by-jowl with the National Gallery. It seems fitting that the Oriel opened with exhibitions of water-colours by Percy French and of oils by George Russell, better known as AE, since both these artists had already featured in OliverÕs life. His parents had met and entertained Percy French whilst honeymooning at the Savoy Hotel in 1913 and Oliver recalls attending AE's funeral in 1935. On asking whose funeral it was, Oliver was told by his uncle: 'When you grow up you will learn a lot more about this great man'. So it was that the Oriel hosted Russell's first posthumous exhibition. These two shows surprised many people as it was not generally known that either of these renaissance-men painted at all. thus commenced a long tradition of the Oriel presenting the unexpected. Markey, for instance. Oliver first met Markey Robinson in 1953 at his studio in Lyle Street, Belfast and was 'struck', as he recounts in '100 Years of Irish Art,' 'by his cryptographic manner of verbal communication and was therefore not surprised that such a one would naturally develop a singular method of graphic presentation'. He subsequently encountered a disillusioned Markey, who, disenchanted by the lack of enthusiasm for his work, came to the Oriel seeding directions to the American Embassy with a view to emigration. Oliver bought the picture that Markey was carrying under his arm, persuaded him to stay in Ireland and thence ensured a long and successful relationship between artist and gallery. A long relationship has also grown up between The Oriel and the works of the more established painters such as Paul Henry RHA, RUA [1876-1958], William Conor RHA, RUA [1884-1968], James Humbert Craig RHA, RUA [1878-1944], Frank McKelvey RHA, RUA [1893-19574]. 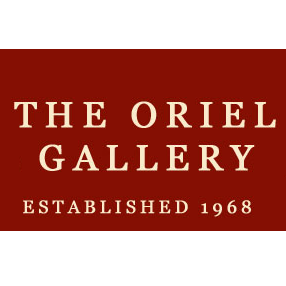 The Oriel has also mounted many group exhibitions featuring such luminaries of Irish art as Jack B Yeats, Nathaniel Hone, William Leech, Roderic O'Connor, Walter Osborne, Sir John Lavery, J A O'Connor, William Sadler, Daniel O'Neill and Sean Keating. On the walls of The Oriel are also to be found many and varied examples of the work of Maurice MacGonigal, Charles Lamb, Stanhope Forbes and Norman Garstin. A niche is reserved for contemporary and abstract paintings by such artists as George Campbell, Colin Middleton, Gerard Dillon, Gretta O'Brien and Louis le Brocquy.